Dereck Chisora-Denis Boytsov for European crown on September 21st - who wins? Dereck Chisora will be back in action again next month, just over two months after his stoppage win over the previously unbeaten Malik Scott, and “Del Boy” will look to take away another top level fighter’s perfect record on September 21st as he is set to face Russia’s Denis Boytsov in a bout that will contest the European heavyweight belt. 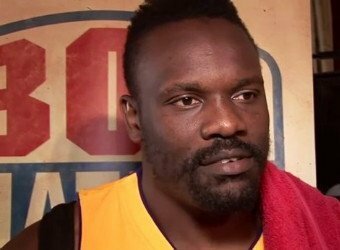 According to the web site of UK trade paper Boxing News, Chisora-Boytsov will take place on Frank Warren’s show at the Copperbox Arena in London. Warren’s debut show at the Copperbox will also feature (according to Boxrec) Billy Joe Saunders-John Ryder for the British middleweight title, Frankie Gavin-David Barnes for the British and Commonwealth welterweight titles, Liam Walsh-Joe Murray for the Commonwealth super-featherweight belt and Paul Butler-Miguel Gonzalez for the WBO inter-continental super-flyweight strap. That’s a solid card indeed, especially when you realise how Saunders, Ryder, Gavin, Walsh, Murray, Butler and Gonzalez are all unbeaten fighters. It will possibly be the heavyweight fight that bags most of the headlines, however. 27-year-old Boytsov is 33-0(26) and the German-based Russian has strung together two wins since returning to action from an injury. 29-year-old Chisora is 17-4(11) and he is coming off two stoppage wins that followed his loss to David Haye. The two heavyweights will be fighting for Kubrat Pulev’s vacated European title. Having the look of a very good quality match-up, between two heavyweights who are almost the exact same size at 6’1” and around the same weight when in top shape (as they should be for this one), a good case can be made for either guy winning. The big question, though, may be: is Boytsov the same fighting machine he once was? How has that time out of the ring affected him? I see a distance fight, with Chisora doing enough to win a close one on the cards. You are here: Home / Boxing News / Dereck Chisora-Denis Boytsov for European crown on September 21st – who wins?